Snap-on standing seam Product Features • Ideal for transition roofs • Herr-Voss corrective leveled • Stiffener beads available • 20 year non-prorated finish warranty • Maximum panel length of 45’ ASTM Tests • ASTM E283/1680 tested • ASTM E331/1646 tested Florida Building Product Approvals • FL Product Approval 6191-R3 • 36 stocked colors (24 gauge steel) • 35 stocked colors (.032 aluminum) • Galvalume Plus available 1" • UL-580 Class 90 rated over solid substrate (steel only - up to 18” O.C.) 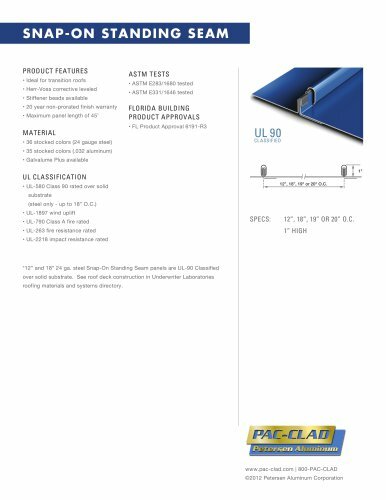 • UL-1897 wind uplift • UL-790 Class A fire rated • UL-263 fire resistance rated • UL-2218 impact resistance rated *12” and 18” 24 ga. steel Snap-On Standing Seam panels are UL-90 Classified over solid substrate. See roof deck construction in Underwriter Laboratories roofing materials and systems directory.